Click for larger image and caption. Mission scientists are discussing this and other Pluto and Kuiper Belt findings this week at the joint meeting of the American Astronomical Society Division for Planetary Sciences and European Planetary Science Congress in Pasadena, California. "We're excited about the exploration ahead for New Horizons, and also about what we are still discovering from Pluto flyby data," said Alan Stern, mission principal investigator from Southwest Research Institute in Boulder, Colorado. "Now, with our spacecraft transmitting the last of its data from last summer's flight through the Pluto system, we know that the next great exploration of Pluto will require another mission to be sent there." 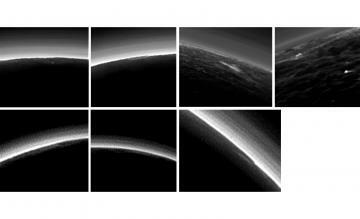 Stern said that Pluto's complex, layered atmosphere is hazy and appears to be mostly free of clouds, but the team has spied a handful of potential clouds in images taken with New Horizons' cameras. "If there are clouds, it would mean the weather on Pluto is even more complex than we imagined," Stern said. Scientists already knew from telescope observations that Pluto's icy surface below that atmosphere varied widely in brightness. Data from the flyby not only confirms that, it also shows the brightest areas (such as sections of Pluto's large heart-shaped region) are among the most reflective in the solar system. "That brightness indicates surface activity," said Bonnie Buratti, a science team co-investigator from NASA's Jet Propulsion Laboratory in Pasadena. "Because we see a pattern of high surface reflectivity equating to activity, we can infer that the dwarf planet Eris, which is known to be highly reflective, is also likely to be active." 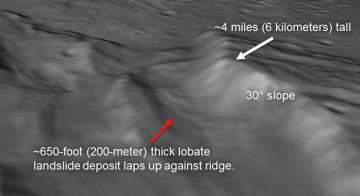 While Pluto shows many kinds of activity, one surface process apparently missing is landslides. Surprisingly, though, they have been spotted on Pluto's largest moon, Charon, itself some 750 miles (1,200 kilometers) across. 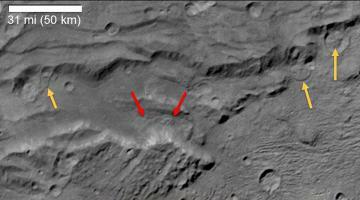 "We've seen similar landslides on other rocky and icy planets, such as Mars and Saturn's moon Iapetus, but these are the first landslides we've seen this far from the sun, in the Kuiper Belt," said Ross Beyer, a science team researcher from Sagan Center at the SETI Institute and NASA Ames Research Center, California. "The big question is will they be detected elsewhere in the Kuiper Belt?" Both Hubble and cameras on the New Horizons spacecraft have been aimed at KBOs over the past two years, with New Horizons taking advantage of its unique vantage point in the Kuiper Belt to observe nearly a dozen small worlds in this barely explored region. MU69 is actually the smallest KBO to have its color measured – and scientists have used that data to confirm the object is part of the so-called cold classical region of the Kuiper Belt, which is believed to contain some of the oldest, most prehistoric material in the solar system. "The reddish color tells us the type of Kuiper Belt object 2014 MU69 is," said Amanda Zangari, a New Horizons post-doctoral researcher from Southwest Research Institute. "The data confirms that on New Year's Day 2019, New Horizons will be looking at one of the ancient building blocks of the planets." The New Horizons spacecraft is currently 3.4 billion miles (5.5 billion kilometers) from Earth and about 340 million miles (540 million kilometers) beyond Pluto, speeding away from the sun at about nine miles (14 kilometers) every second. About 99 percent of the data New Horizons gathered and stored on its digital recorders during the Pluto encounter has now been transmitted back to Earth, with that transmission set to be completed Oct. 23. New Horizons has covered about one-third of the distance from Pluto to its next flyby target, which is now about 600 million miles (nearly 1 billion kilometers) away. The Johns Hopkins University Applied Physics Laboratory in Laurel, Maryland, designed, built, and operates the New Horizons spacecraft, and manages the mission for NASA's Science Mission Directorate. In addition to being the home of the mission principal investigator, SwRI, based in San Antonio, leads the science team, payload operations and science planning. New Horizons is the first mission in NASA's New Frontiers Program, managed by NASA's Marshall Space Flight Center in Huntsville, Alabama. For more on the New Horizons mission, visit www.nasa.gov/newhorizons and http://pluto.jhuapl.edu.